Today AMD is launching the R9 290 which is based on the same Hawaii chip found in the R9 290X and is aimed directly at Nvidia’s GTX 780. The launch of the 290X completely reset the premium graphics card landscape by forcing Nvidia to initiate massive price cuts and bringing a little bit of sanity to the way GPUs are priced. But because the R9 290X is such a good deal AMD is having trouble keeping online retailers stocked. 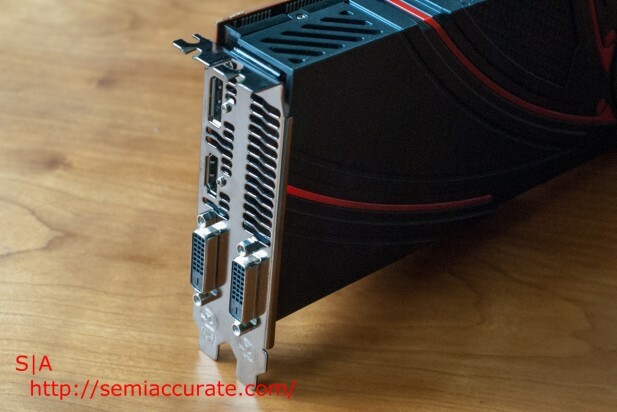 Despite the current shortage of 290X’s AMD is still going ahead with the launch of the straight 290 which is very similar to its faster brother. The R9 290 uses the same blower design as the 290X. 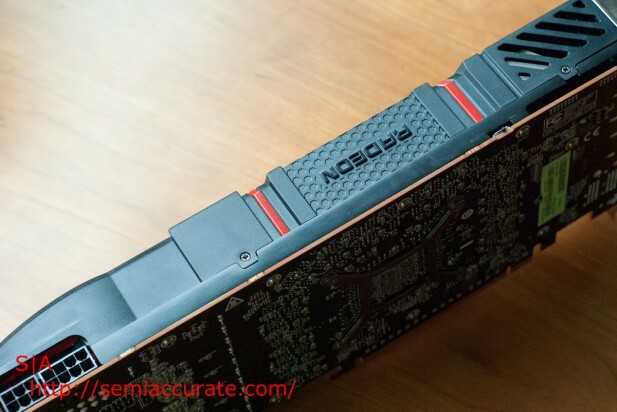 Unfortunately this is a cooling solution that has consistently received poor marks from most reviewers. Anecdotally though, I haven’t found the 290X or 290 to be any louder than the HD7970 GE that proceeded it. The PCB is also exactly the same as the 290X and were it not for the stick on back of the card with the 290 product code, it would have been easy for us to mistakenly assume that AMD had sent us a second 290X for Crossfire testing. 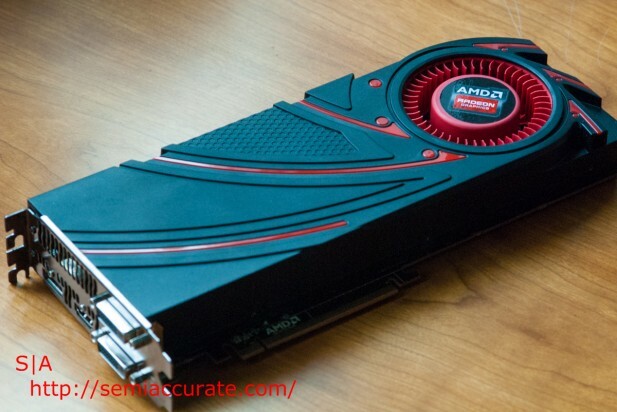 As a few sites reported the R9 290 was set to launch last week on 31st. But AMD made a last minute decision to reposition the 290 in its pricing stack and make the card faster so that it could go head-to-head with Nvidia’s GTX 780 which is priced at $500 in an attempt to undercut the 290X. Knowing that the R9 290 is officially priced at $399 leaves little doubt that AMD is continuing to significantly undercut competitive cards from Nvidia. There’s not a whole lot new about the R9 290’s architecture, but suffice to say that AMD’s disabled about 10 percent of the Stream Processors on the 290X to create the 290. As Uber mode showed to the world AMD’s new PowerTune technology makes over clocking your GPU as easy as increasing its fan speed. GPU’s and modern microprocessors in general have always been sensitive to heat, but with Hawaii, AMD has effectively made fan speed the governor of clock speed. 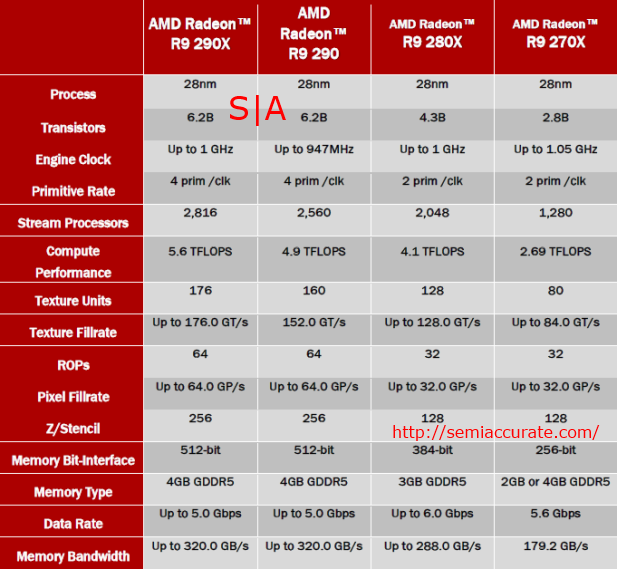 If reviewers have reached one point of consensus about AMD’s R9 Series GPUs it’s that, when the AIB vendors start rolling out custom cooling solutions we should expect significant performance differences between AMD’s reference designs and those custom cards, more so than in any generation prior. 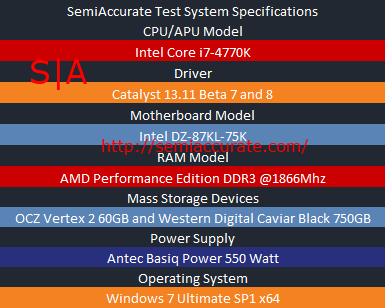 Let’s get into the benchmarks. We’ve included benchmarks of the R9 290 on the older Beta 7 drivers which were introduced before AMD decided to change the positioning of the R9 290 with the Beta 8 drivers. Please note that all of our benchmarks ran at a resolution of 1080P on a system configured as shown below in Quiet mode. 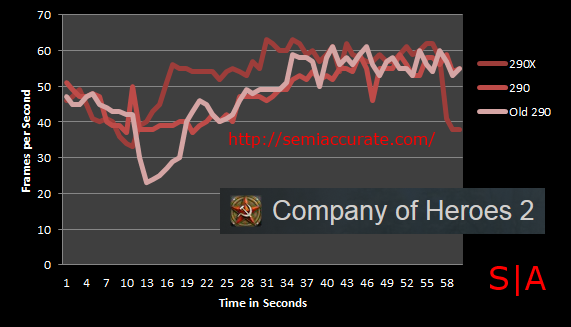 Here we have the 290X with a clear lead on the both versions of the 290, which seem more or less tied for 2nd place. Performance in this title on all of these GPUs is excellent. In this RTS title we have the 290X clearly in the lead, with the 290s tied for second with a harsh frame rate hit for the old 290 early in the run. In the greatest video game expansion pack of the late 1980’s we have the 290X in the lead again, and the new 290 with a slight lead over the older version. 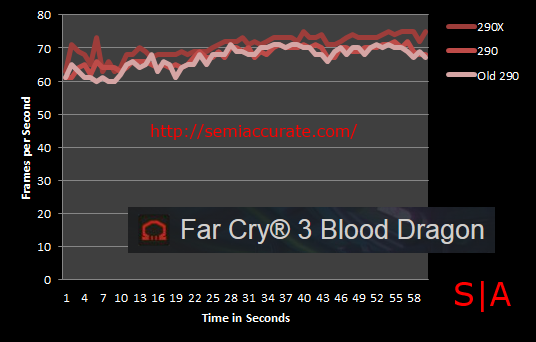 In Crysis 3 all three of these GPUs perform more or less the same, by providing playable frame rates in the low 40’s. 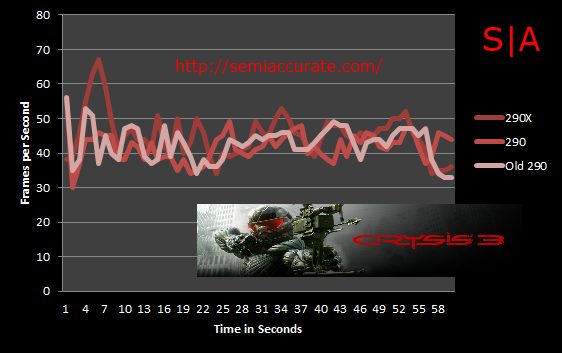 It seems that raw GPU power is not the limiting factor in Crysis 3’s performance at 1080P. In other words, “CPU is the bottleneck”. With a multiplayer mode that crashes as soon as it’s launched Battlefield 4 has kept this reviewer out of the fight since its first patch, which ruined everything. But single player works just fine so we can see the R9 290X with a small lead over the 290 which has a small lead of the old 290. 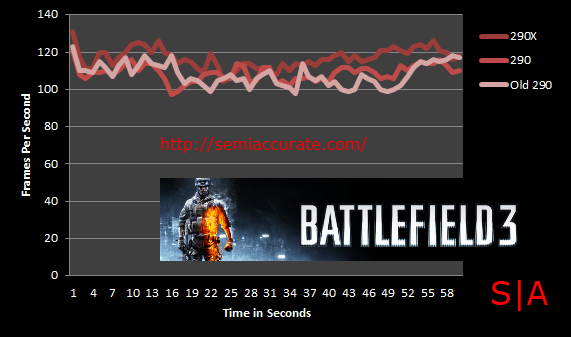 Here’s a chart to show the average frame rates of our GPUs and quantify their performance levels in a more concrete way. 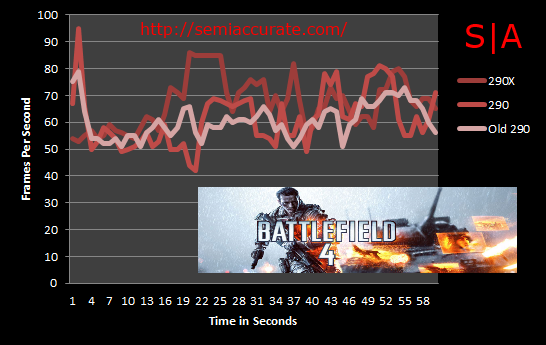 We’ve also included our Bioshock data in this chart as the game only reports average frame rates. The big take away here is that with 10 percent less compute units the 290 is only seven percent slower than it’s big brother and $150 cheaper. It’s hard to believe, but I think AMD might have just out done the previous performance per dollar standard it set with the R9 290X which was in-and-of-itself stunning.